It's been a while! Sorry for being so quiet. I'd like to say that I've been too busy with work and graduate school to post, but the truth is, I've had free time, I've just been doing other things. I did notice some new followers, so thanks for being patient with me! Getting back into the swing of things, I thought I'd give LOOK chocolate another try. LOOK has been hit or miss; their French- and Italian-themed collections were fantastic, but their plain chocolates left a lot to be desired. 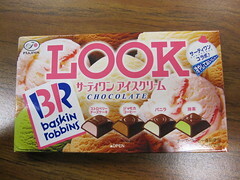 This is the Baskin Robbins collection, so naturally, the four flavors are ice cream inspired. It's fitting to start off with Jamocha Coffee because the coffee flavor seemed to find its way into many of the adjacent chocolates. On its own, it was all right. 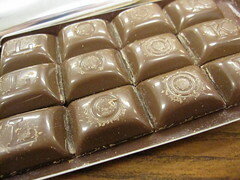 The milk chocolate went well with the mild coffee flavor, and it definitely reminded me of a blended iced coffee drink. Strawberry Cheesecake had a slightly tart berry flavor with a hint of yogurt. It didn't really taste like cheesecake, but it was still tasty. As I mentioned, I think there was some flavor mingling going on, because some of the Strawberry Cheesecake pieces had a weird and off-putting coffee note. Matcha, always the flavor I look forward to the most, had a slight bitter matcha flavor, but it was so subtle that it was easily overwhelmed by the milk chocolate. It was disappointing. One of the Matcha pieces tasted like coffee, too. Vanilla had a sweet fake vanilla flavor. It was pretty standard fare, but the coffee essence seeped into a couple of these pieces, too. It wasn't too bad for this flavor. Overall, when the non-coffee flavors didn't taste like coffee, they were fine, but flavor mingling was an issue in this package (even though they were well within the expiration date). It didn't happen to every piece, but I'm thinking the fresher you can get these, the better. The chocolate looks a little worse for wear. I wonder if, despite being within the expiration date, it was a bit long in the tooth. I've tried a Baskin Robbins one, but it was a different group of flavors (no matcha, but orange sherbet) and there wasn't so much coffee leakage from the Jamocha one. I've had similar issues with Look as you - sometimes, it's really good and sometimes not so great. Still, they're worth a try most often, though perhaps only when super fresh if this sort of flavor mixing can happen! Thanks for the info! I wonder if the chocolate lost a little something heading overseas. The elements are not kind to chocolate in the best of circumstances, so that may have something to do with it. I agree, Look is always fun, even if not delicious.